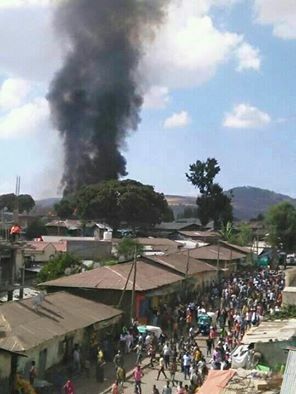 Ethiopian netizens are reporting that the largest prison in Gonder, Northern Ethiopia, commonly known as Bahita prison, which is believed to house over 3000 prisoners, has caught fire. At least 30 prisoners have so far died due to the blaze while hundreds managed to escape. Armed police officers are trying to prevent the rest of the prisoners from escaping. Bahita prison reportedly accommodates political and non-political prisoners detained fr various types of crimes. The local fire brigade is trying to contain the fire. Some sources say the fire started in the kitchen.